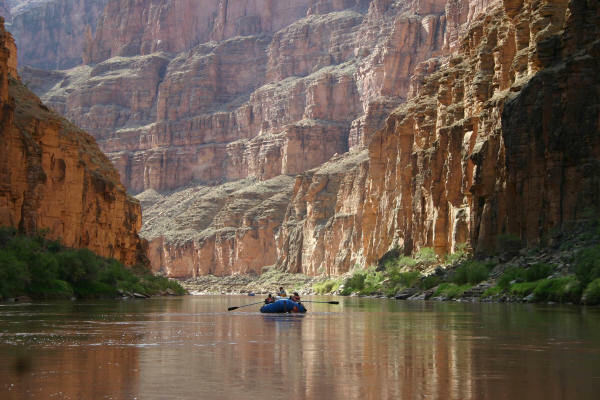 When you raft the Grand Canyon you are traveling through history of over millions of years. The picture on the left really shows the majesty of the Grand Canyon and although it is spectacular this picture really does not do justice to the Grand Canyon and all of its splendor. The Colorado River has carved this canyon out of the rock, sand and limestone over millions of years to give us this spectacular scenery that is one of the wonders of the world. If you have a chance to raft down the Colorado River through the Grand Canyon, you should take it. The trip can be truly spectacular. This canyon is over a mile deep in spots and you can really appreciate it when you are standing on the top of the ridge looking down at the river far below. If you are rafting down the river, you also get an idea of the true majesty of the grand canyon gorge. We have driven to the south ridge of the Grand Canyon several times to view the canyon and visit some of the sites on that rim. The north rim of the canyon is over 10 miles away and the river is over one mile deep from the edge of the rim at that point. Many people hike from the south rim to the river and back, taking over 2 days to complete the trip. Most people will hike down one day and back up the next. Anyone planning to visit the river from this point will need to make arrangements to camp out or book a place in the bunk house along the river. Otherwise you will need to hike down and back the same day which can be a pretty tough trip if you are not in great shape. There is a road that takes you to the north rim and another that takes you to the west rim of the canyon. We have not been to either, although friends, who have been to these rims, tell us that the views are even more spectacular than the south rim. If you are planning to visit either of these rims, from Las Vegas, you can arrange for a bus tour and even a helicopter ride into the canyon and lunch on the canyon floor. A great trip no doubt, but nothing would beat the ride down the river in the middle of the canyon. If anyone reading this post has taken this raft trip into the Grand Canyon, we would really like to hear from you. Your comments and description of your trip would be much appreciated. Anyone we have spoken with about these trips whether it is to one of the rims or along the river itself, they have all thoroughly enjoyed their experience.